CABBY was founded in 1964, and have a custom-built manufacturing factory in Kristinehamm, Sweden. Approximately 1200 caravans and 75 motorhomes are produced each year. The quality is outstanding, and the caravans are designed for all-year use down to temperatures of minus 40°C. Because of the construction CABBY caravans give all year damp and condensation free comfort - warm in the winter – cool in the summer. The construction is unique and encompasses the latest technology with regard to self-supporting, sandwich-construction walls. They utilize special “powerlock” system with screws and specially developed adhesives. CABBY use polyurethane beams instead of wood to additionally prevent water ingress. The specification is comprehensive, and includes underfloor heating, ALDI wet heating system with boiler and radiators. All furniture lockers and seating are designed to allow full air circulation throughout the caravan. An Alko chassis is incorporated together with the AKS system of assisted electronic braking and ATC to stabilise the caravan against snaking. 15” alloy wheels are fitted, tyres are filled with Nitrogen gas instead of “air”, as Nitrogen is much more stable, runs cooler and is more consistent. There is less likelihood of variations in tyre pressure. CABBY manufacture thirty-four models, from the 570 up to the twin axle 800. There are 2 widths; 230cm and 250cm. Models – the model range is extensive. 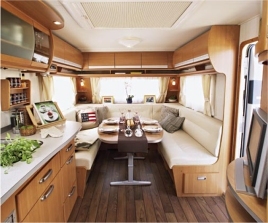 From a 570 F3 which has a French (double) bed at the rear and a lounge at the front up to a Cabby 800 with 2 bunk beds at the rear, French bed and a front lounge. There are 64 variations available within the range catering for all requirements. 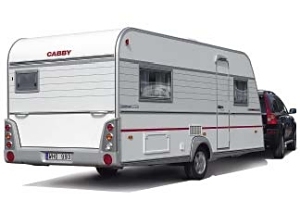 Cabby caravans are completely winterized – which in practice offers a very comfortable caravan in both winter and summer. The law in the UK has now changed to enable normal cars to tow caravans up to 2.5 metres wide, as long as the weight ratio between the gross weight of the caravan and the car is within the acceptable parameters. The 85% rule is a good guide for safe towing. We have known the Cabby brand for a number of years, and are very impressed with their quality and model range. 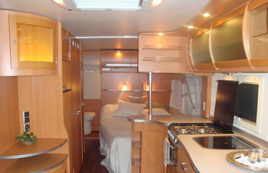 They offer high specification, winterised caravans for the discerning customer. We are not an authorised dealer – we are an independent company assisting customers.